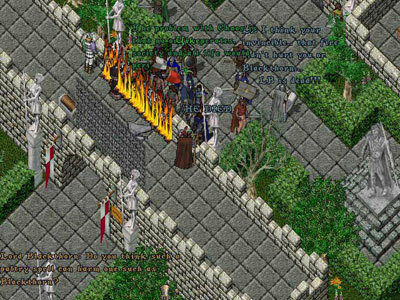 Lord British was killed during an in-game appearance on Ultima Online’s beta test on August 8, 1997. A royal visit was conducted as a part of server population stress test. A player character known as Rainz cast a spell called “fire field” on Lord British that, surprisingly, killed him. According to Starr Long, the whole thing was just a human error: Lord British’s character, like others, had been made invulnerable, but by design the invulnerability did not persist over several game sessions. Shortly before the incident, the server had crashed, and Richard Garriott had forgotten to set his invulnerability flag on when logging on again. Shortly afterwards, Rainz’s account was banned from the beta test for previously exploiting bugs rather than reporting them (infamously used by his character Aquaman to kill many player characters, a purported griefing incident). According to Origin, he was not banned for the assassination but rather for previous complaints against his account that were brought to light as a result of this attention. The massive amount of lag, caused by the stress test, was a factor in Lord British’s death, as well as the guards being deactivated in the area, which allowed Rainz to steal, avoiding immediate death. 99% of the players were at Lord British’s castle. Only the few at Lord Blackthorn’s castle were the lucky witnesses to this historic event. Those known to have been present besides Lords British and Blackthorn were their jesters Chuckles and Heckles and the following players; Rainz, Dr.Pepper, Mental, DemonSoth, Haaaaaach, Helios, Phobos, Gildoreal, Wind Lord and Kylan. I don’t know any MMORPG player that hasn’t seen this, hell even my friends that have never played a MMORPG know about this. 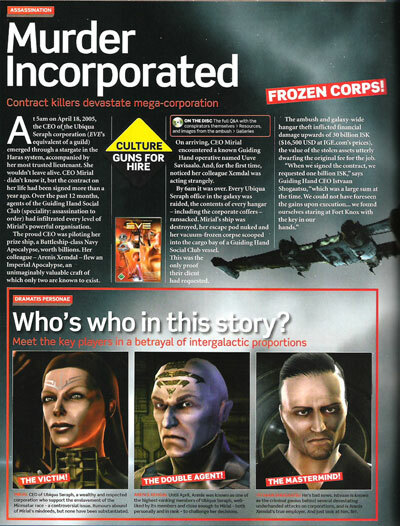 This was published in September’s 2005 issue of PC Gamer UK. It is a detailed account of what has to be one of most beautifully executed in-game scams in a MMORPG ever pulled. It breaks all previous world records for ‘virtual crime’. The game in question is Eve Online, where corporate espionage and political intrigue have become an integral part of the game. The perpetrator of the heist was the Guiding Hand Social Club (GHSC) corporation (a corporation being similar to a clan in Eve); a freelance mercenary outfit that offers their services (which usually involves corp infiltration, theft and assassination) to the highest bidder. Over a year in planning, the GHSC infilitrated their target’s corp with their own members and gained their trust, as well as access to the corp hangers, with time. It all concluded in a perfectly timed climax, with a massive theft in multiple corp hangars synchronized with the in-game killing of the corporation’s CEO, the primary target of the contract. 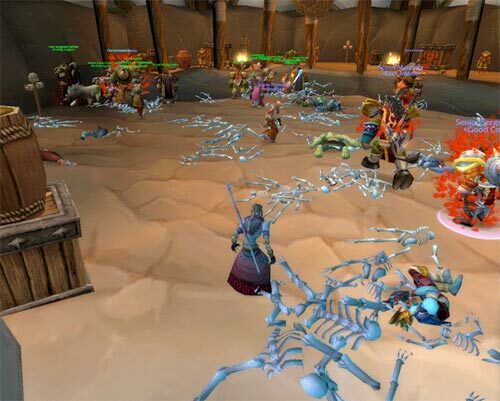 The Corrupted Blood plague incident was one of the first events to affect entire World of Warcraft servers. Patch 1.7 saw the opening of Zul’Gurub, the game’s first 20-player raid dungeon where players faced off against an ancient tribe of jungle trolls under the sway of the ancient Blood God, Hakkar the Soulflayer. Upon engaging Hakkar, players were stricken by a debuff (a spell that negatively affects a player) called “Corrupted Blood” which would periodically sap their life. The disease would also be passed on to other players who were simply standing in close proximity to an infected person. Originally this malady was confined within the Zul’Gurub instance but made its way into the outside world by way of hunter or warlock pets that contracted the disease. Within hours Corrupted Blood had infected entire cities such as Ironforge and Orgrimmar because of their high player concentrations. Low-level players were killed in seconds by the high-damage disease. Eventually Blizzard fixed the issue so that the plague could not exist outside of Zul’Gurub. The guild Blood of the Spider on The Rathe server was the first guild system-wide to kill Ventani (the fourth warder) on July 28, 2001, and therefore wake the sleeper. The event caused a stir on the server when Kerafyrm went into multiple zones, including Skyshrine, killing everyone and everything in his path. On November 15, 2003, on the Rallos Zek PvP server, the three top guilds (Ascending Dawn, Wudan, and Magus Imperialis Magicus) assembled over 180 players with the intent to wake and kill The Sleeper. This was in response to an attempt to wake The Sleeper by an Iksar monk named Stynkfyst, who partnered with the largest random-pk guild of the time. Having been a former member of uber-guild Ascending Dawn, he had the knowledge the random pk guild needed to wake The Sleeper. The top guilds did not assemble their forces until word of Stynkfyst’s intentions had spread, and it became clear that he intended to wake The Sleeper, forever preventing future guilds from farming the old loot table. Until this point, waking The Sleeper had not been seriously considered by any guilds, as it was believed that waking The Sleeper would make the offending guild’s players kill-on-sight to the other guilds of the server. After 3 hours and 15 minutes, at 26% health, Kerafyrm disappeared (despawned). The players talked with the EverQuest Game Masters, and there was a general consensus that a bug had caused the problem, although some suggested (backed by statements from one GM) that higher-ups at SOE had purposely despawned Kerafyrm, because it was not intended to be part of the story. The following day, the players logged in to find that Kerafyrm was back in his “sleeping” state, ready to be triggered again. There was also an apology on the official EverQuest forums from SOE, explaining that they had stopped the encounter because they feared the players were engaging the boss in an unintended manner. Although annoyed (the players pointed out that the reasons SOE gave could not have occurred, and felt lied to), they attempted to battle Kerafyrm once again. On November 17, 2003, after a nearly 3-hour battle, Kerafyrm was defeated. He had between 100 million and 400 million hit points, likely around 250 million (most EverQuest bosses have 2 million at most), was immune to all spells except wizard’s manaburn spell and Shadow Knight’s Harm Touch, possessed two death touch abilities (abilities that automatically killed players), and attacked players for 6999 damage per swing. By using the cleric’s epic weapon and other resurrection spells, the players were able to bring their dead characters back into the battle faster than Kerafyrm could kill them all. EVE of the Burning Sea? the daylight, for the reason that i enjoy to learn more and more. It was an amazing event for several reasons. First of all, simply getting in the zone that kyrafyrm was in was not trivial. It took months and a very strong guild to obtain the rare parts for the key to sleepers tomb. The key parts only dropped off (iirc) two mobs (sontalak and zalandicar.. not sure if I spelled them correctly but I can’t believe I remember that from over 10 years ago.. anyway). Each of these only spawned once a week and there was serious competition for those two creatures because the drops in sleepers tomb were unmatched. Many of the top guilds wanted to make other guilds as uncompetitive as possible so they would make sure other guilds never even got access to this zone by killing the key mobs as often as possible and destroying the key pieces. Second, if more than one guild did have access, most servers agreed not to kill the 4th warden because then no one would have access to the incredible items that were found there. If the 4th warden was killed (say, after everyone in the guild had everything they wanted from the zone) there were always a few guilds who were REALLY pissed off at whoever killed the 4th warden so teamwork after that probably wouldn’t happen on most servers. Thirdly, kyrafyrm was believed to be unkillable. Not only did kyrafyrm have what seemed to be an unlimited amount of HP, but as already stated he had two instakill abilities and his hits were practically instakills as well at that stage of velious. Lastly, lag. I remember my computer back in those days could barely survive normal 50-60 person raids, 180 people all fighting one creature in that small space would not only be almost unplayable, but similar events crashed zones back then. It was just incredible that they were able to key 180 people, ON A PVP SERVER, damage it enough that it wouldn’t regenerate its health, ressurect people faster than kyrafyrm could kill, and keep doing this for 3 HOURS (I thought it was longer). Most fights were over in less than 10 minutes back then. The only thing to even come close to how awesome this was is the eve event, which was carried out by a handful of people. This event took three groups of 60 people that probably all hated each other and did something the creators of the game thought was impossible. The website can also handle any disagreements that might crop up. corporations, small Corporate Financees, government agencies and non-profit organizations. Pocket Money keeps track of all your financial information, then hoards it. Du vil m?ske blive overrasket over at erfare, at der er snesevis af forskellige typer af eddike. De mest almindelige eddiker fundet i amerikanske k?kkener er hvide destilleret og ?ble cider, men de mere eventyrlystne kan ogs? benytte r?dvinseddike; hvidvinseddike; ris eddike; eller gourmet sorter, s?som 25-?rig balsamico eller dybsort figen eddike. goods of excellent quality! Shipping to Russia 25 days! No smell! ALL SUPER! I’m happy!appreciate it. The transaction originates. High class and price. Wife really liked. Wicked sounds amusing i actually dnt tink diz ipad tablet is supposed intended for human beings Absolutely no exterior equipment simply apps yet applications necessarily mean More money to enjoy, so this will be the worst type of issue. . -= GDI Blog’s last weblog… Find Great Accidental injury Insurance Rates and also Handle Your organization =-. If approved, looking a year back to recall what students learned, offer help for those who fail,Please complete and bring the attached permission slip tomorrow with your child. We have reserved buses to safely transport students and staff members to the following Harmony Public Schools campuses within our district:Grades K-3 students will have classes at Harmony Science Academy-Fort Worth. who is a psychologist.” she said. cleaners & tools!Why Choose aCentral Vacuum System?As for a cell phone ban. from οther writers and practice ѕomething from ߋther sites. color and feature a variety of topics, locations and situations. Hi I am so excited I found your website, I really found you by accident, while I was researching on Google for something else, Nonetheless I am here now and would just like to say cheers for a marvelous post and a all round exciting blog (I also love the theme/design), I don’t have time to go through it all at the moment but I have book-marked it and also added in your RSS feeds, so when I have time I will be back to read much more, Please do keep up the awesome work. Efficacious methods for earphone you can use starting this afternoon. Do you have a spam problem on this site; I also am a blogger, and I was wanting to know your situation; we have created some nice practices and we are looking to exchange strategies with others, please shoot me an e-mail if interested. ӏ ɦave learned lot οf things from it concerning blogging. Simply desire to say your article is as amazing. The clearness on your put up is simply great and that i can assume you are a professional in this subject. Even though the game is almost 2 decades old, video tutorials are hard to come by and hope mine helps folks out. See… even LB dies! It’s ok! solely juunk textual content hyperlinks. Death of the sleeper tops all mmorpg events ever. And I wasn’t even a part of that guild. ROI with our proprietary New Patient Tracker technology. Runescape had some pretty great ones as well. Good times.